By Will Robson, freelance journalist and photographer (Instagram @willhrobson). All images copyright of Will Robson unless otherwise credited. 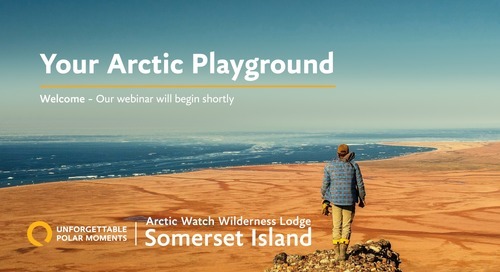 Last summer, I spent a week at Arctic Watch Wilderness Lodge in the Canadian High Arctic, on assignment for the UK magazine Outdoor Adventure Guide. 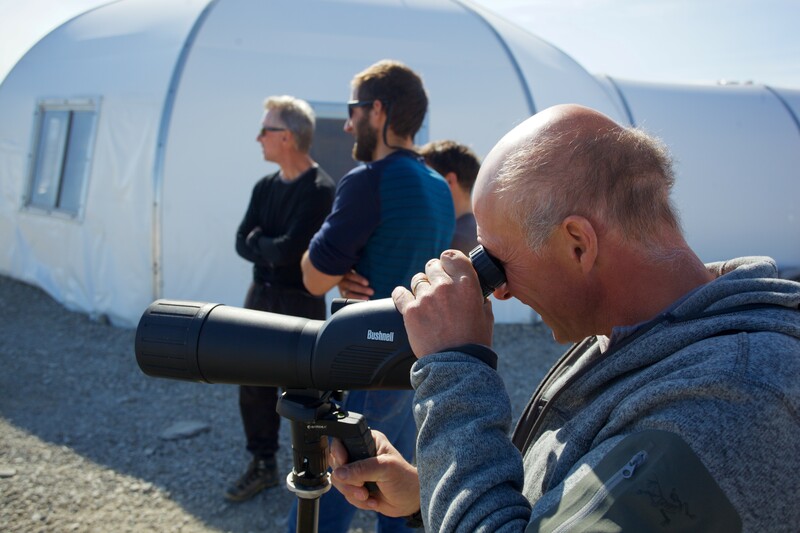 Quark Expeditions® asked if I’d put together some images of and commentary about my Arctic Watch experience. Trying to capture what a trip like this is all about is not easy, but I hope this journal helps inspire some to head north to experience this very special place for themselves. Plan B. Bad weather up north kept us grounded in Yellowknife for a while, so we flew laps around the lakes in an Ice Pilots DC-3, a veteran of WWII. Some may describe them as “20,000 rivets flying in close formation,” but these aircraft are built to last, and give a unique and elemental flying experience. 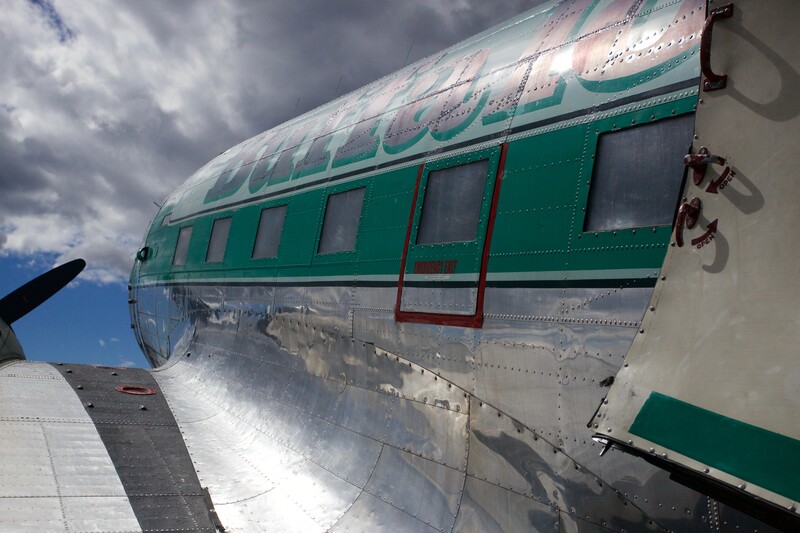 That said, Buffalo Airways snaps up every spare part it finds on eBay, just to keep these tough old warbirds in the air. Ode to joy. 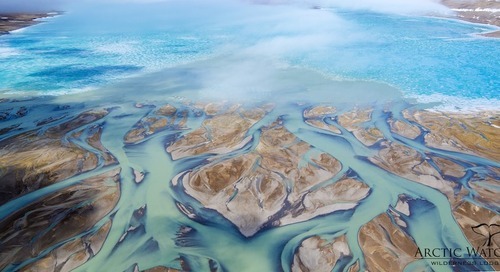 Of the vast uninhabited territory of the Canadian High Arctic, why is this modest little inlet so special? This is why. 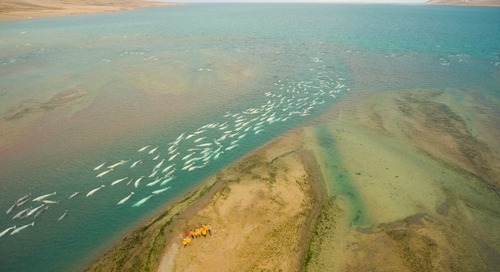 A beluga whale delights in being while mothers and calves play in the nursery shallows of the Cunningham Inlet. 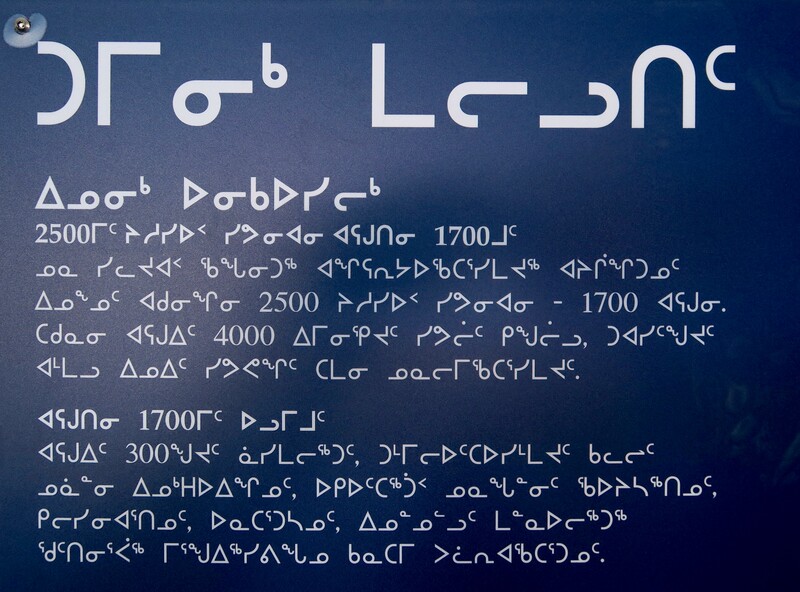 For millennia, only but polar bears and Inuit have seen this joyous show. Today, the whales’ complex behavior and language is being carefully studied to better understand how best to conserve this and other endangered populations in this Polar Region. The baggage handlers look a rough lot. 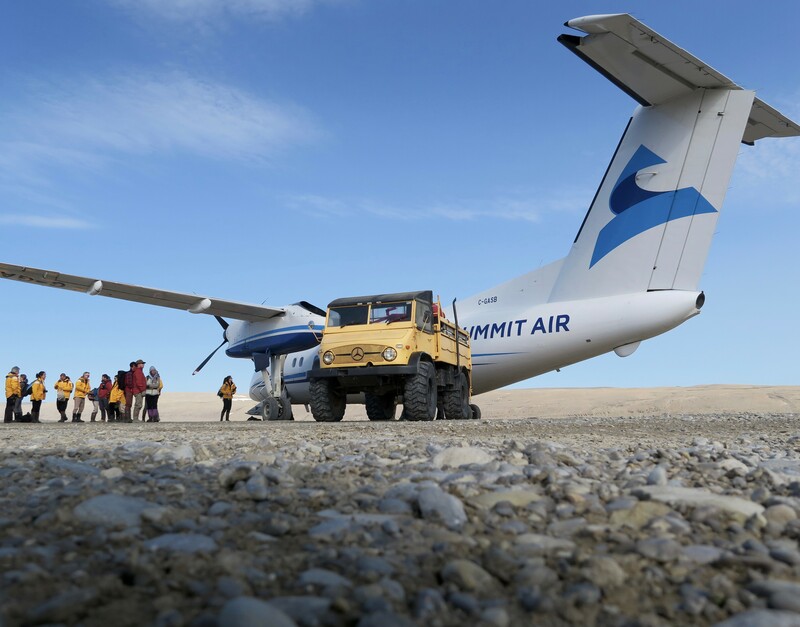 The adventure begins when you step out of the airplane. 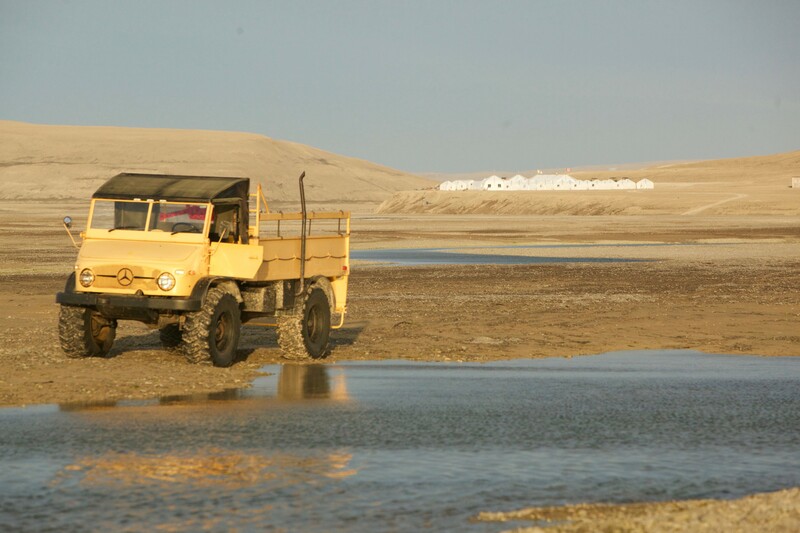 The venerable Unimog truck is loaded up with luggage and supplies. 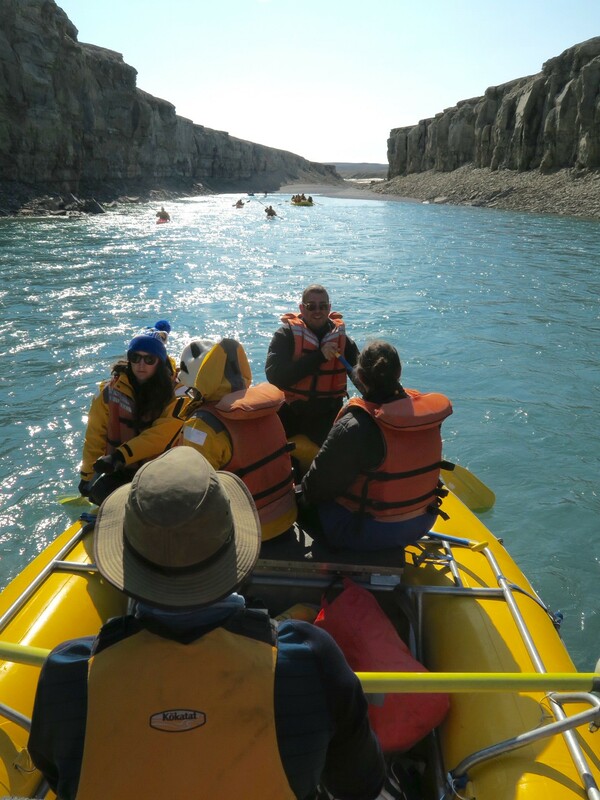 For the guests, it’s a short walk to the Cunningham River before rafting across to the Arctic Watch camp. Home. 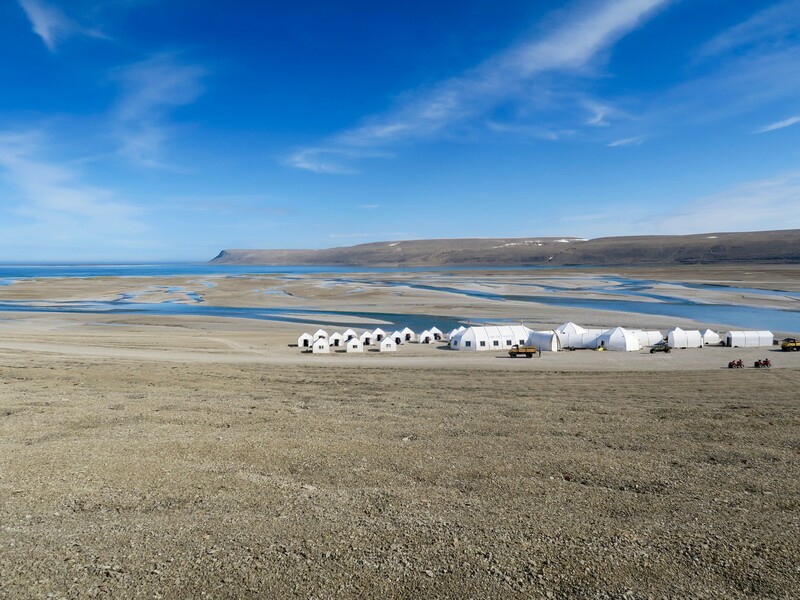 Over the brief arctic summer, “moon base” Arctic Watch is pitched on a bluff above the myriad channels of the Cunningham River estuary. 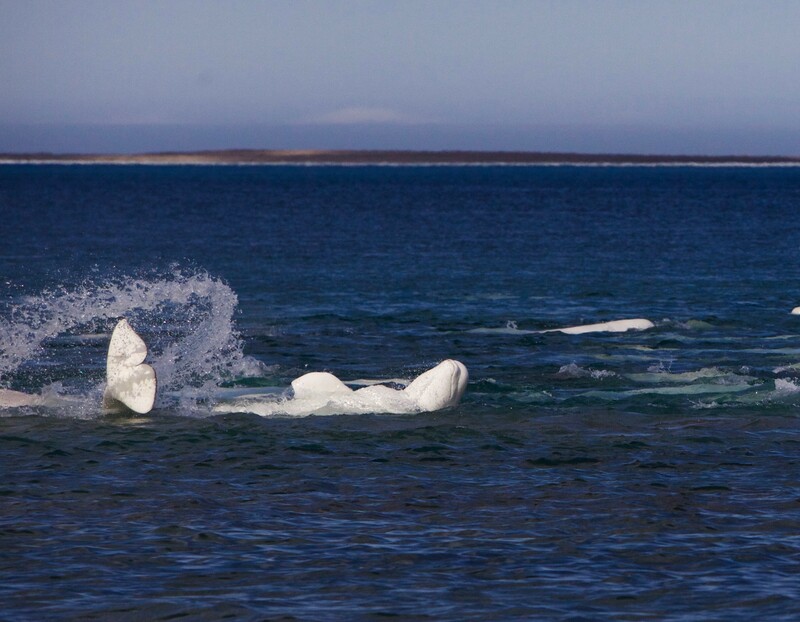 The landscape may look a little desolate, but life here during the short summer changes up a few gears, even if that means belugas sometimes get trapped for a while in the meandering shallows. Someone to watch over me. Demon has saved lives, warning of polar bears close to camp. 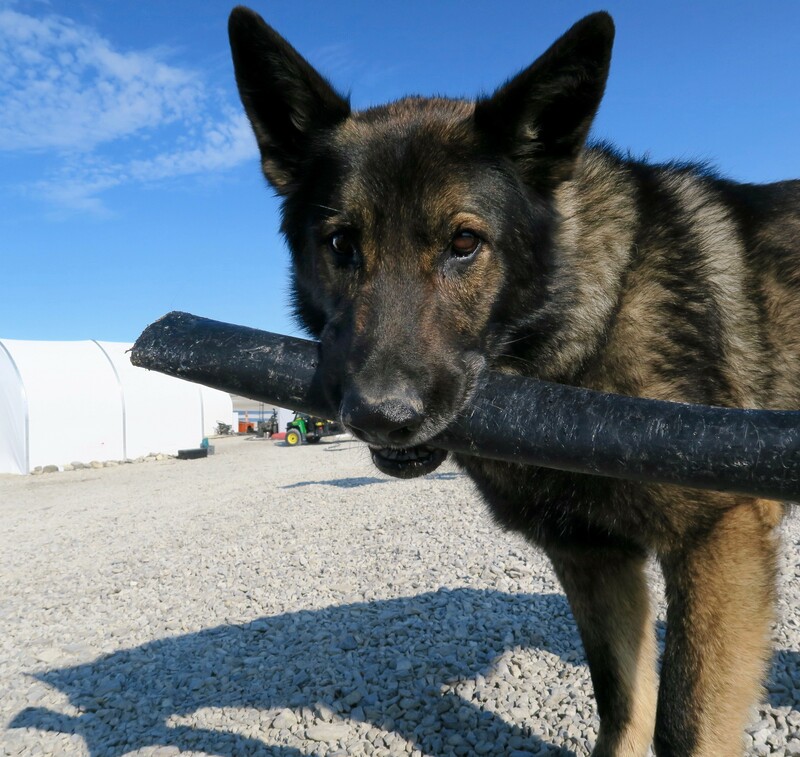 He treasures his plastic pipe (no sticks round here). If you throw it, he’ll bring it back, but he absolutely will not let go. Which would be a failing if he were a Labrador. Beauty takes many forms. Arctic Watch’s two Unimogs date from the 1960s. 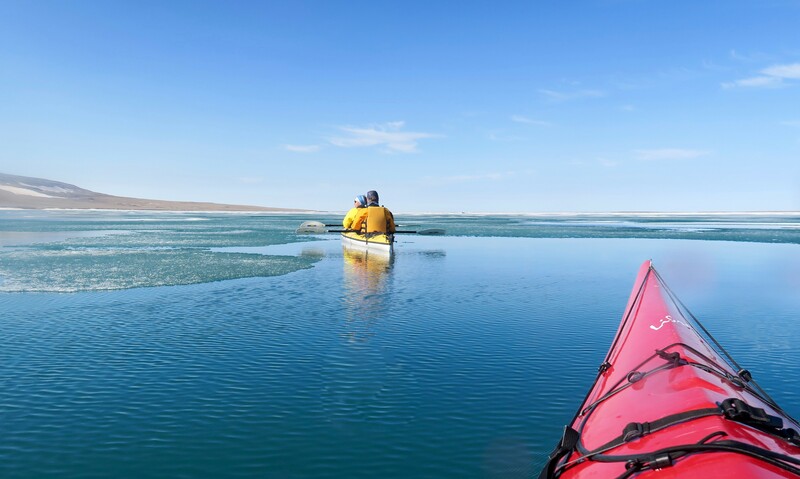 Driven over the frozen Barrow Strait from Resolute, their simple, sturdy mechanicals make them the ideal workhorse for Somerset Island, steadily transporting guests and gear through rivers and across the rough and rolling terrain with dependable ease. 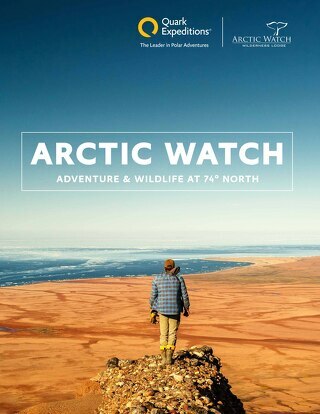 Putting the “watch” in Arctic Watch. 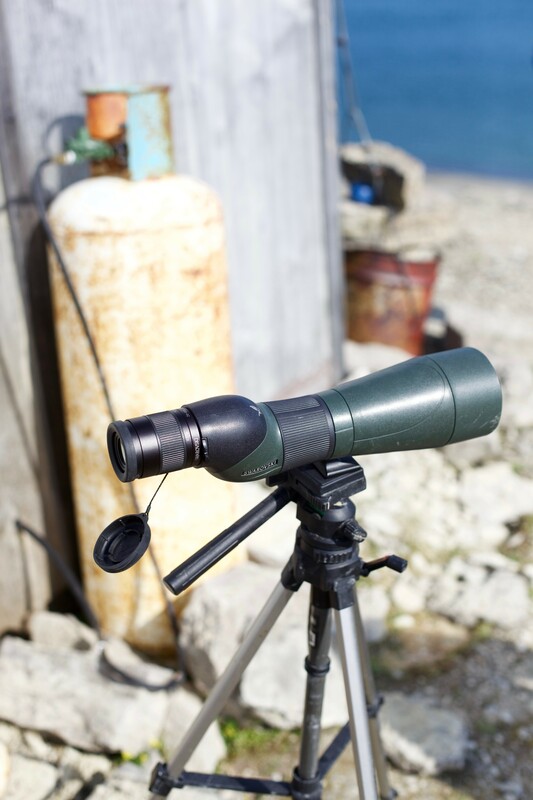 The telescope is a key tool of the whale watcher’s trade. 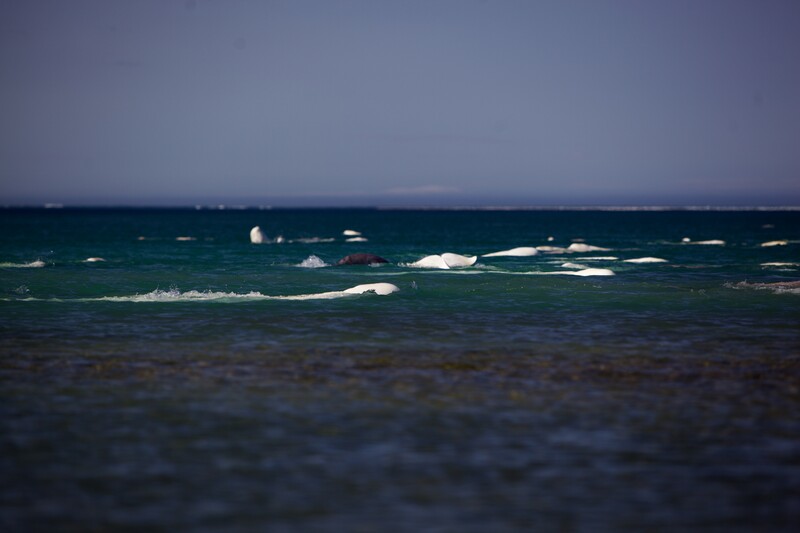 Cunningham Inlet is one mile (2 km) across and contains over 1,000 belugas at peak nursery hours. Even so, the whales move between favored spots at different times of the day, so monitoring them is a ceaseless business. 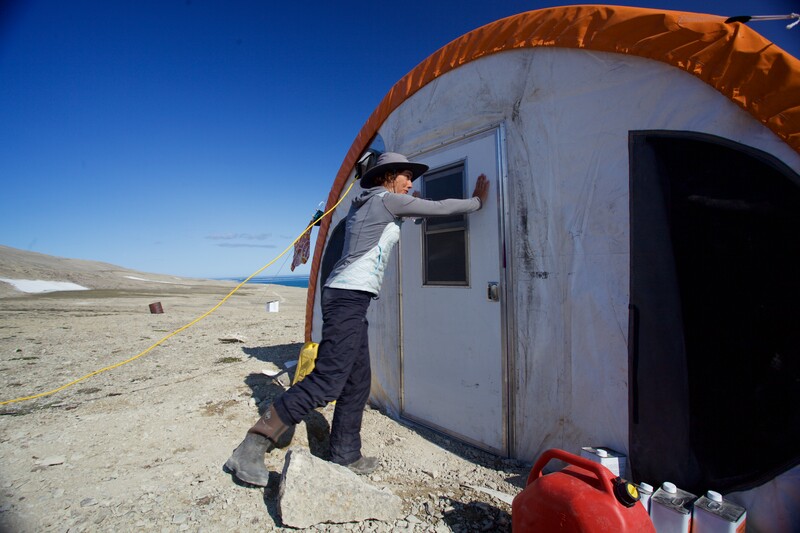 “And then he went like this with his front paws.” Ace beluga scientist Valeria Vergara recounts how an inquisitive polar bear pounded on her door the night before. This was the only solid part of her tent. She kept her cool, radioed base camp a mile away, and had her shotgun ready until he was scared off by the sound of an ATV engine. Armed and dangerously suave. 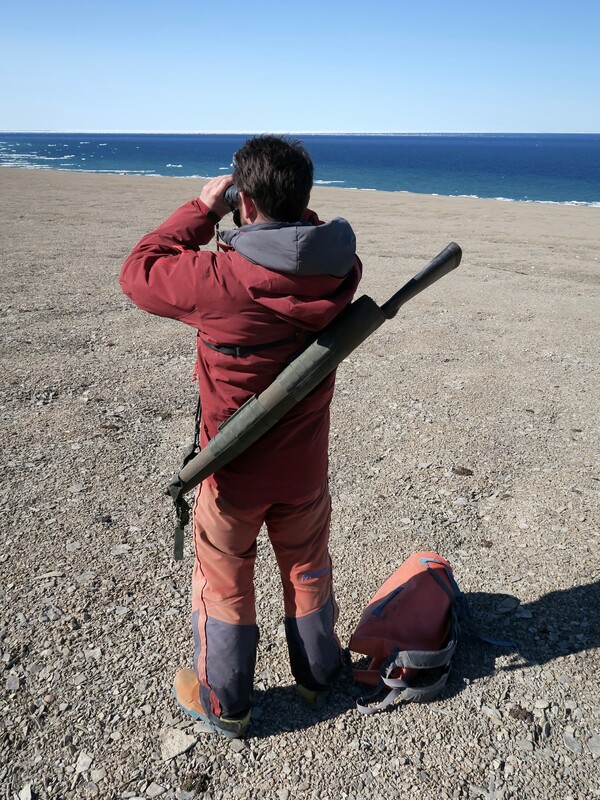 It’s reassuring, if a little alarming, when our guide leaps up to scan the shoreline for polar bears; his shotgun is slung across his back in a fast-access holster. He’d be the last man on earth to want to shoot a bear, but as he says, their curiosity and lack of fear mean you just can’t take chances with one of the most dangerous predators on the planet. But is it art? 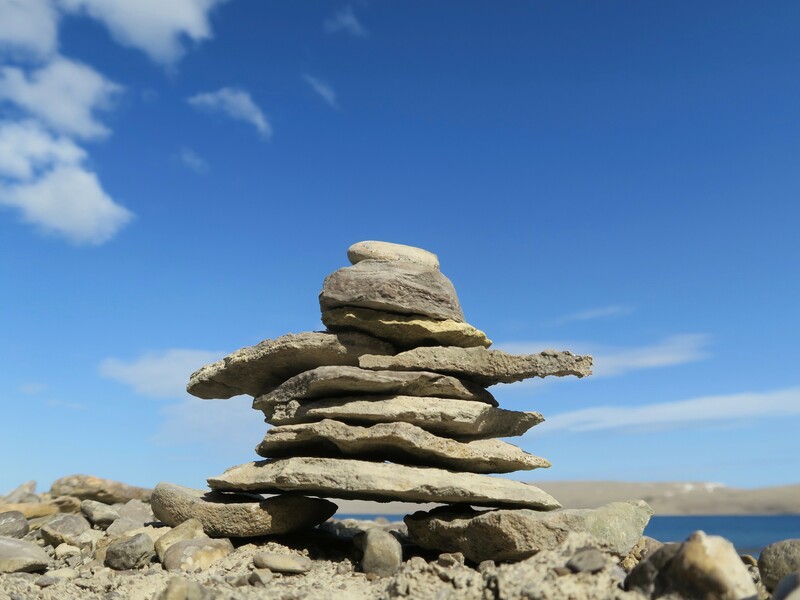 My attempt at building an inukshuk stone figure, with apologies to countless generations of polar peoples. Grandmother’s footsteps. 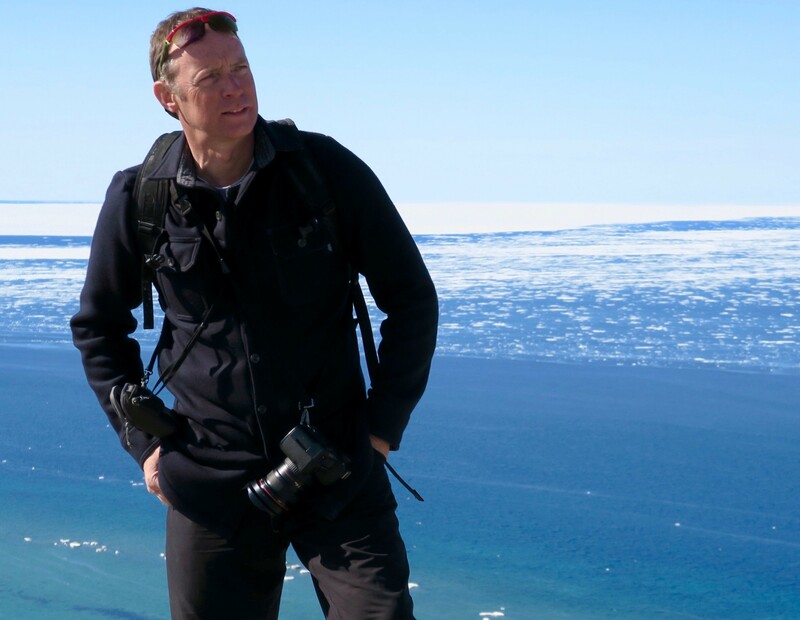 Stalking a bearded seal lying on the edge of the sea ice. 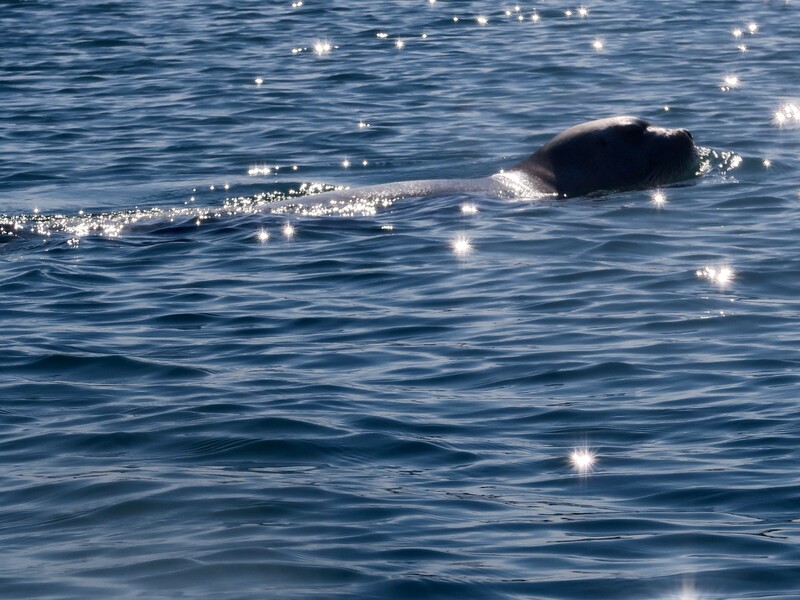 He shuffled into the sea long before we got close, but he later swam round our kayak flotilla – unusual behaviour for a creature so wary of polar bears and Inuit hunters. I called him Barry. Our guide Tessum said this seal’s very unusual curiosity was likely to get him killed soon enough. Since he was a friendly bearded seal from the Barrow Strait, I felt I had no option but to name him. Besides, anthropomorphism is an English tradition. Bearded seals usually stay well away from men and bears. They are highly prized by hunters – they make far better eating than the more common ring seal. I imagine that polar bears feel the same. Bonne chance, Barry. Shell shock. 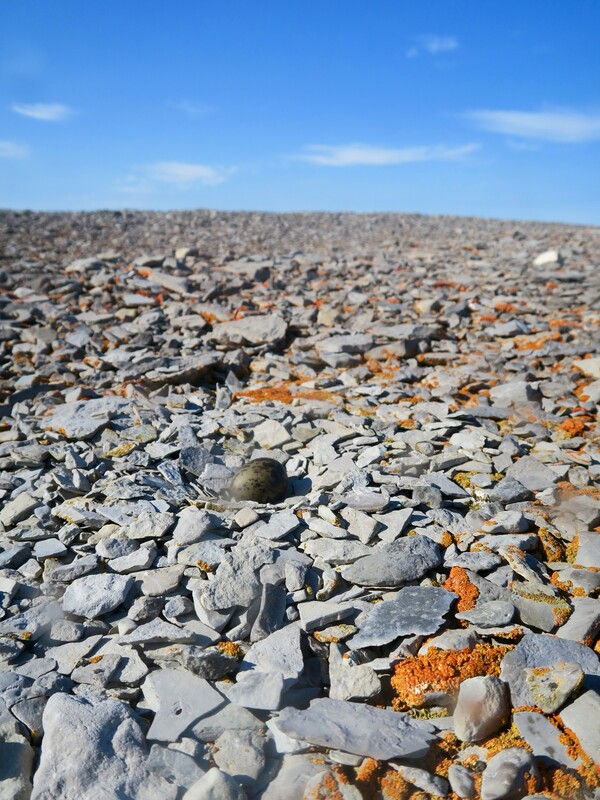 I didn’t see the arctic tern’s nest until I almost stepped on it. I realized then that I was adrift in a minefield of life, with angry parents wheeling above. If a polar bear swims to this barren scythe-shaped island of shale at the mouth of Cunningham Inlet, it can eat hundreds of eggs. High tech. For years, belugas were counted from a rickety scaffold in the inlet’s shallows. 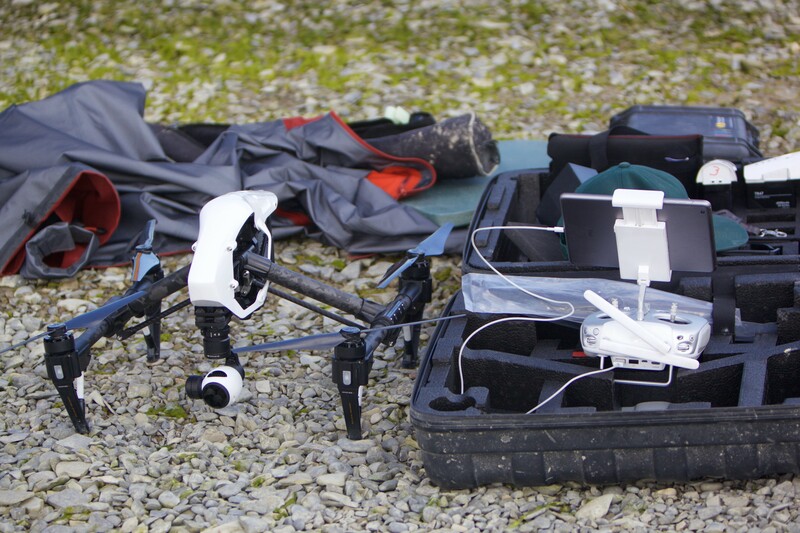 One pass of Nansen Weber’s drone gave scientist Valeria a perfect snapshot of the number of whales. Et voilà! Stay low, stay downwind and move slowly. 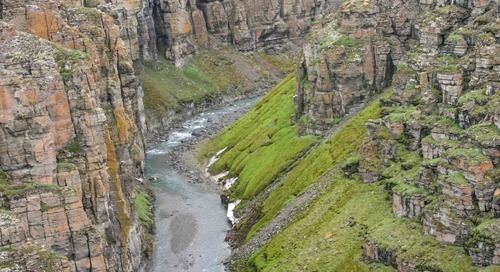 Stalking skittish muskoxen on an escarpment above a nameless river. Muskoxen have an underlayer of soft qiviut fur that enables them to withstand arctic winters. It’s about the warmest natural material there is. Raiders of the lost balloon. 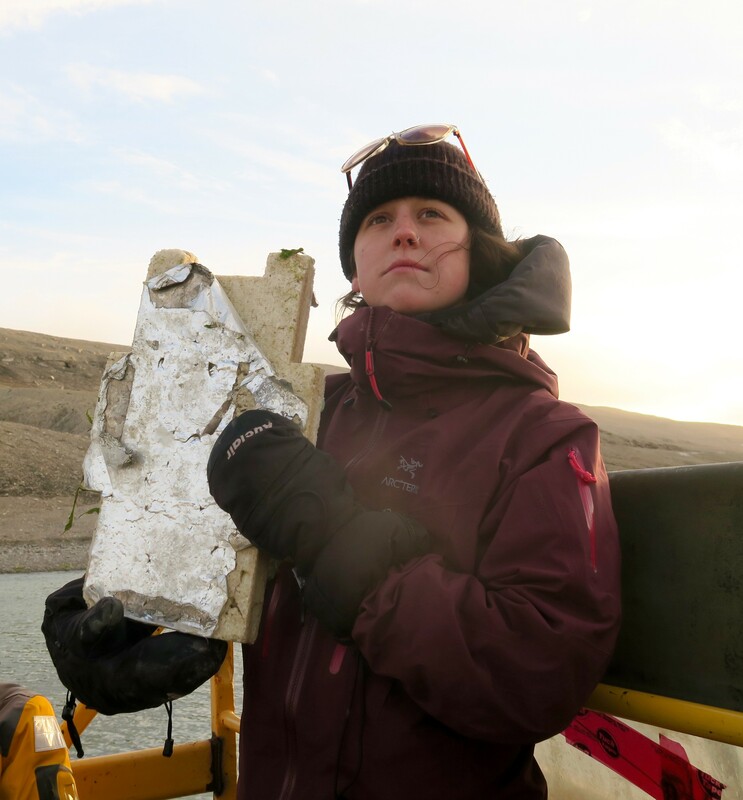 Arctic Watch’s Madison proudly holds aloft a fragment from a lost Google Internet balloon. A reward is available for anyone who finds more convincing evidence than this. I’m told the search will continue this summer. Bone yard. 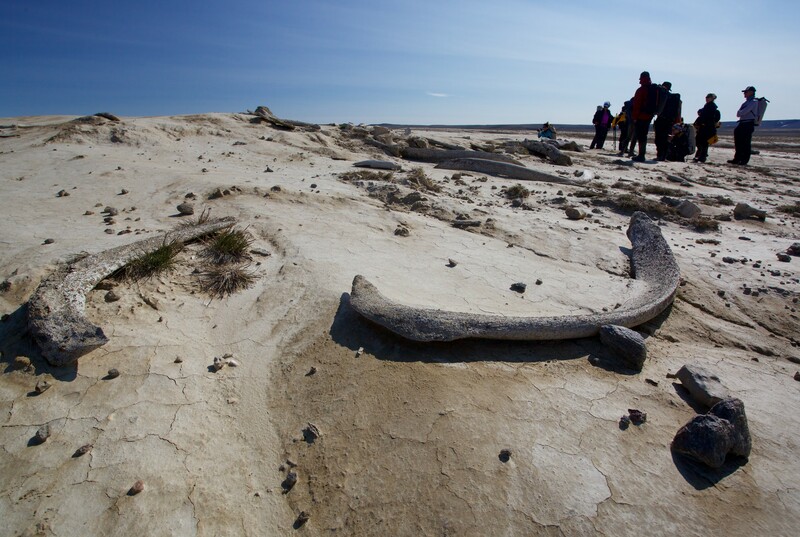 Miles inland from the Arctic Watch camp, we came across the fossilized bones of bowhead whales lying exposed on what was once a muddy seabed. 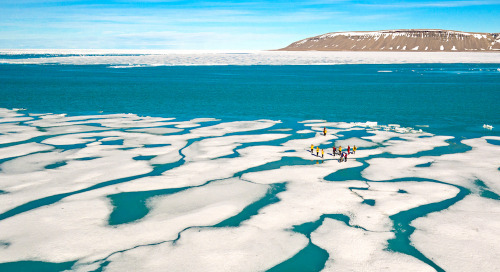 On an island 9,650 miles (25,000 km) square, it makes you wonder what else lies within its undisturbed interior. Thereby hangs a tale. 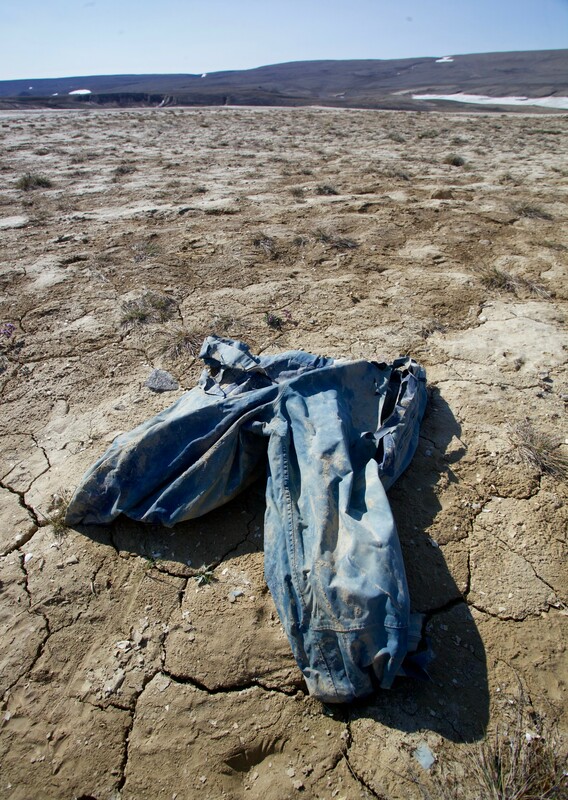 On an uninhabited Arctic island, landmarks are hard to come by, so Richard Weber’s long-abandoned overtrousers, now baked into the mud, are a useful waypoint on the hike to the bend in the Cunningham River where the rafts are put in. Rolling on the Cunningham River. It ran fast, deep and dark onyx green in the canyons, then widened into riffling, racing shallows, breaking out onto the plains. I kayaked alone for much of the way, and it was magical. 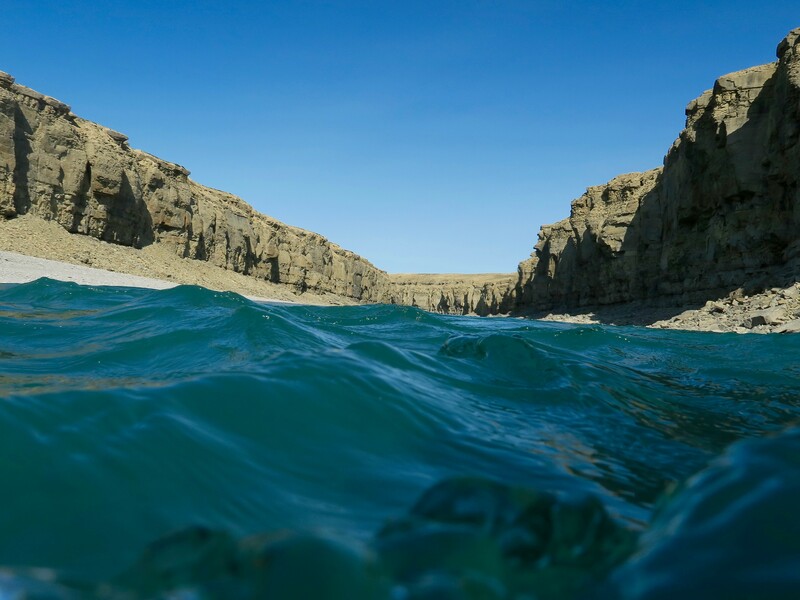 Many miles upriver, the canyons cleave twice this depth and have never been explored. Rafting through the canyons. It’s smooth rafting on the river, with no rocky rapids to barrel through. 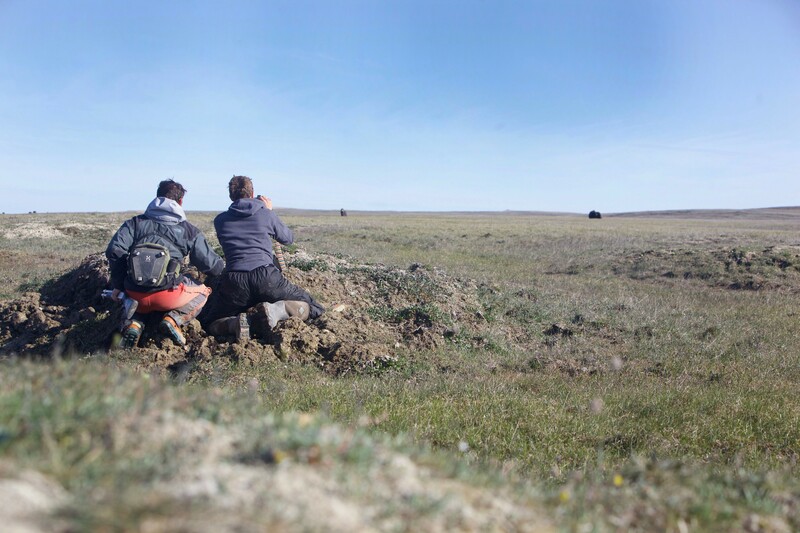 Muskoxen graze on the escarpments above, and we run ashore to try to get close enough to photograph them. Wily beasts: 1. Noisy humans: 0. Better luck next time. Putting the “cunning” in Cunningham. 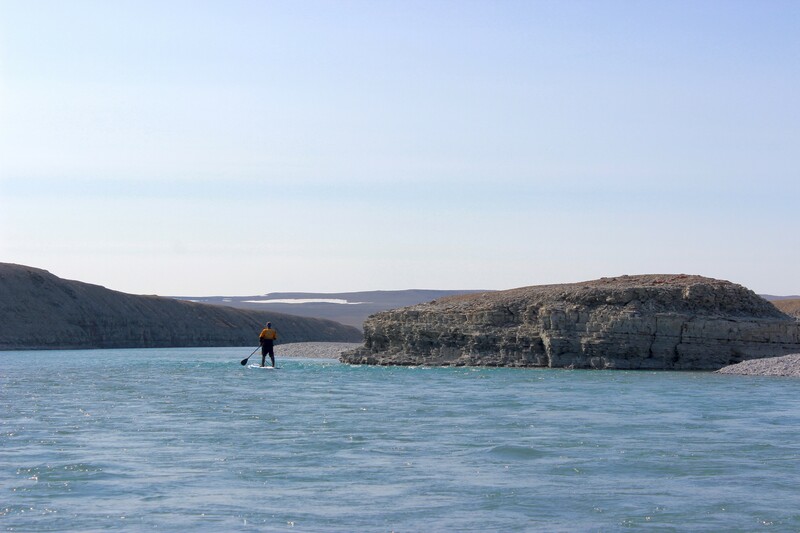 “Have you ever tried stand-up paddleboarding?” they asked me. “Nope, but how hard can it be?” Not so difficult once I’d filled my mukluk boots with river water to lower my center of gravity. 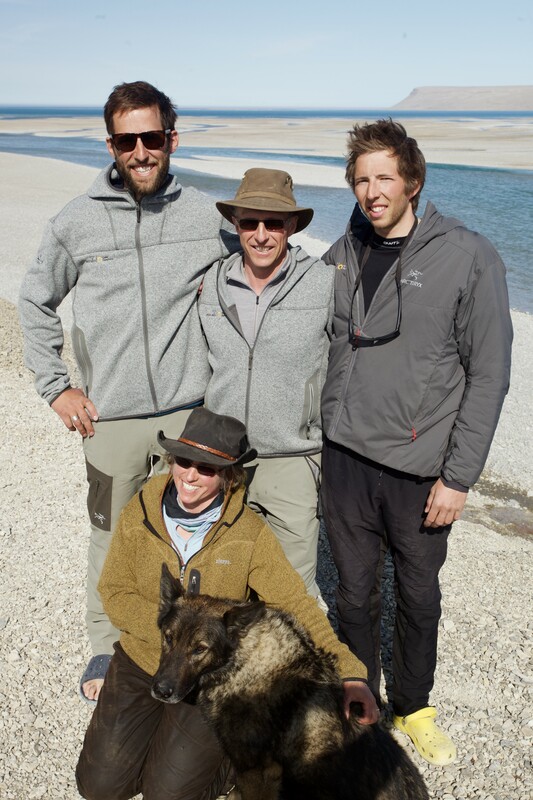 “I counted them all back.” Each team may have a GPS, sat phone and shotgun, but Richard Weber keeps his steely eye on guests and guides. If they’re late returning from daily excursions, with a telescope he zeroes in on the direction from which they should be appearing. 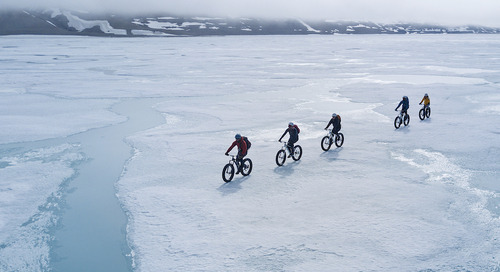 One of the world’s most experienced polar guides, he knows how little margin for error the wilderness allows. Willow the wisp. 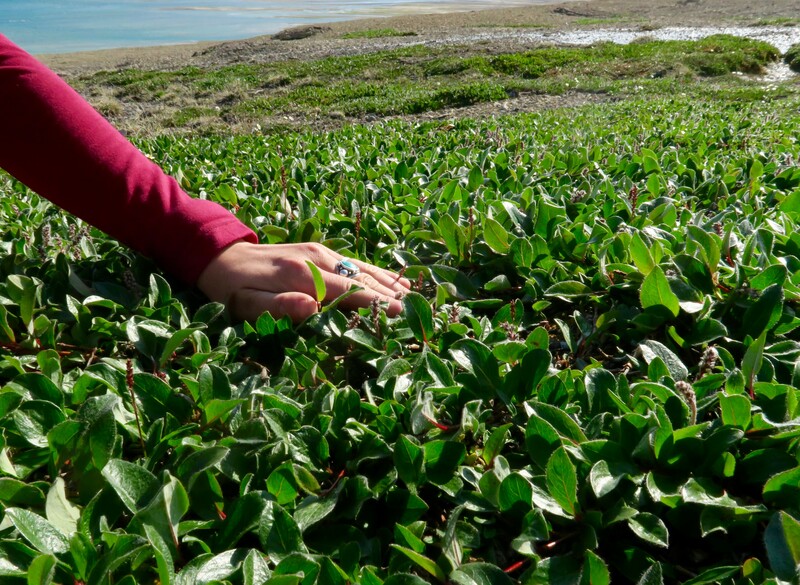 Arctic Watch’s Madison sweeps her hand across the bright green leaves of the arctic willow. 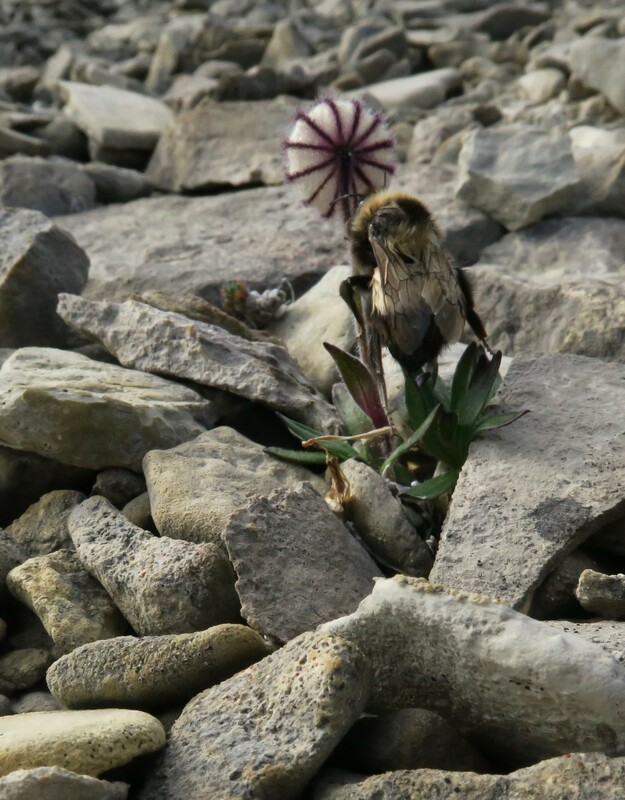 The species has evolved to grow across the surface of the harsh terrain, with its female and male catkins fruiting in August. Muskoxen and arctic hare like to graze on it. I think I would too if I lived here without Arctic Watch’s chef Justin. Route finding through the shallows. 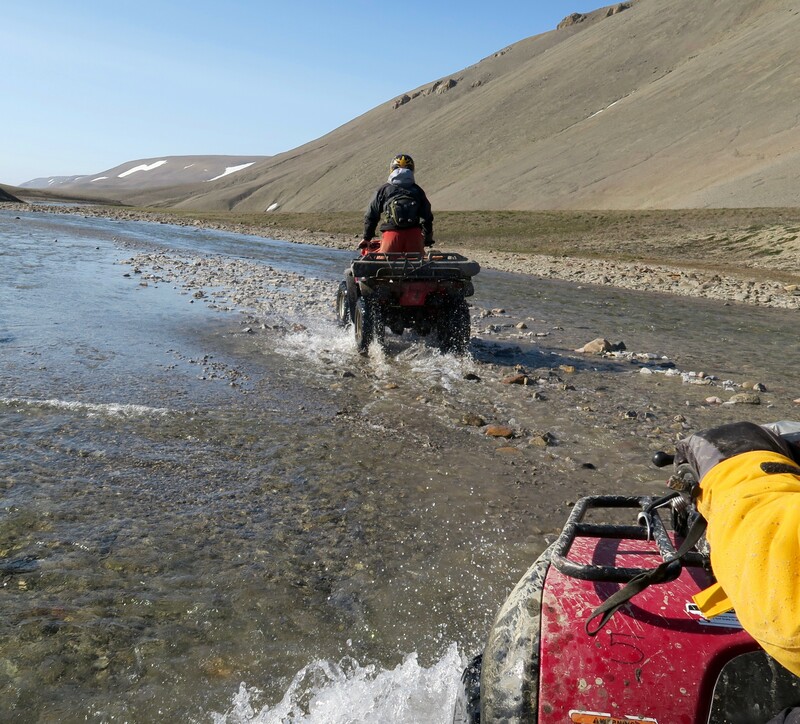 A guide stands to see farther down the nameless river in a trackless wilderness as we ATV back some 19 miles (30 km) from catching arctic char in a semi-frozen lake. Our riding skills got better as the day went on: slow is smooth; smooth is fast. High above the Barrow Strait, it’s eerie to think that Sir John Franklin’s ill-fated circa 1846 expedition passed behind where I’m standing, before they disappeared to become the most enduring mystery of the Northwest Passage legend. The sunken wreck of his flagship, HMS Erebus, was discovered in 2014, a few hundred miles south of this point, off King William Island. In the spirit of those times, I’m wearing my woollen McNair mountain shirt. Life and death on Somerset Island. 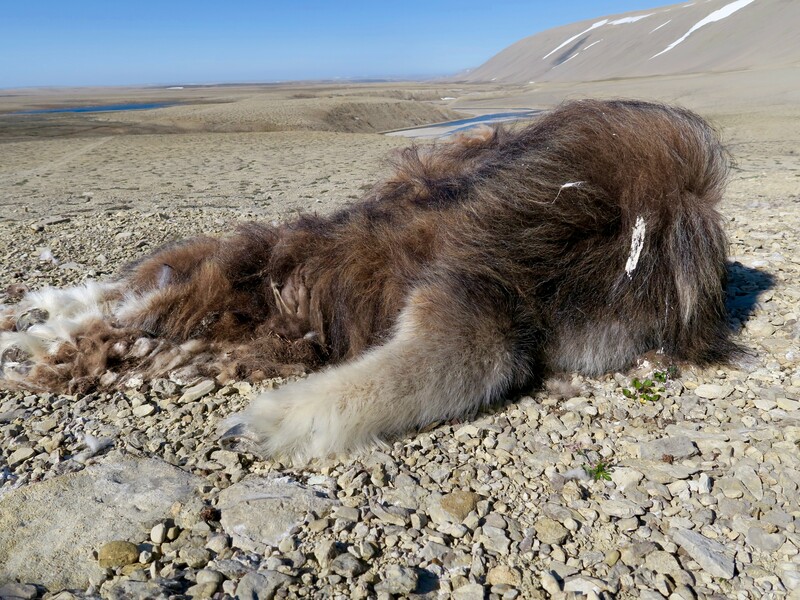 This musk ox calf didn’t make it. We came across this sad sight on a barren ridge above a nameless river, the wind gently tugging at its soft fur. Shooting the shooter. Quark sent photographer and guide Dave Merron to encourage and advise guests how best to use whatever camera they’re shooting with. Smartphone cameras are getting better, but the shyness of the wildlife and the open vistas of Somerset Island almost demand that you use an SLR camera with wide-angle, zoom and 50 mm lenses. Dave runs a seminar after dinner, talking through everything, from settings to composition to postproduction. Bustling beluga. We pointed our camera lenses seaward, hoping to catch the split-second “perfect shot” of a whale arching its head and tail or bobbing up high to look around, but capturing wide-angle images of this precious inlet full of belugas brought a satisfaction of its own. The (partly) Swiss Family Weber. It’s hard to think of a more formidable yet friendly team. Yellow Crocs are banned in the Canadian provinces but, fortunately for Nansen Weber, not in the territories. Touchdown and it’s time to go. 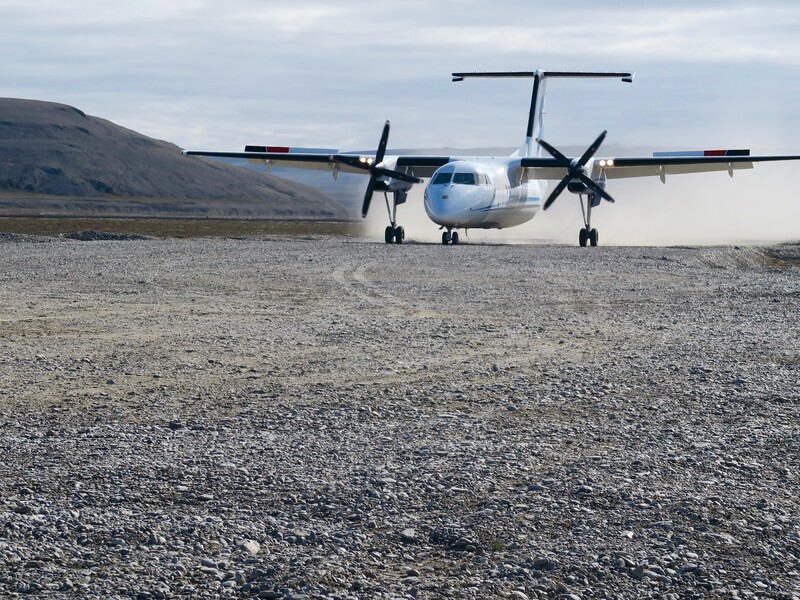 Summit Air’s Dash-8 lands safely on Arctic Watch’s home-rolled airstrip after a four-hour flight from Yellowknife, with one refueling stop. 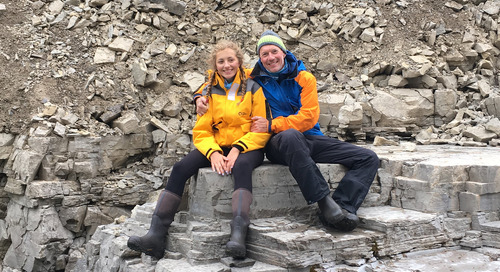 The few seconds spent hurtling across the leveled shale belies how much effort it took to build this essential connection to the outside world. Alphabets of the world: No. 89. Resolute airfield.